Matthew Manarino over at Panel Bound has reviewed the first two chapters of Makeshift Miracle and he's impressed with the story so far. 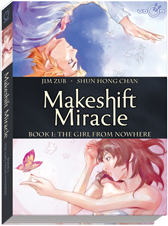 "...the first two chapters of Makeshift Miracle have the makings of a really great comic. Jim Zub has captured the dialogue of an angst filled teenager who simply wants life to slow down yet is placed in an extraordinary circumstance."